Back to some baseball cards with the 2019 Donruss which I hadn't seen in hand before this pack. Props for the design but it sure seems like a team logo would look great in that right hand corner. I try not to hold the lack of MLB license against these but it can still be tough. That said these are some good looking cards. They didn't recycle an old design and went with something new and I think it worked. I was very happy with my pull. Ozzie Albies was just signed long term and is one of Atlanta's core young players who will be the future of their team. Chris Sale has struggled out of the gate while Jose Altuve is coming off a five homers in five games stretch. Such a great hitter and PC guy for me. That Tellez is one of six retro RC cards I pulled. I'm not a fan of the '85 design but I get what they are going for. These are the Matt Chapman base and photo variation cards. Variations aren't a bad thing but they can be a lot of work trying to find out if you have them. I end up looking at my packs twice to figure these things out after I've looked up the list or photos. The Diamond Kings are OK again utilizing the '85 Donruss design. The Matt Carpenter is an Independence Day parallel. I like it better than the base design here. The backs are pretty plain but that isn't unexpected with Panini Donruss. Zilla is a nickname variation. Overall I like the cards but not blown away. I can see me picking more of these up though they may not be my first cards I reach for. The lack of logos and team names has been driving me nutty for the last few years. This design as you said is begging for a team logo in the lower right corner. UGH. The Harper card at the top of the post I have to laugh at and shake my head. 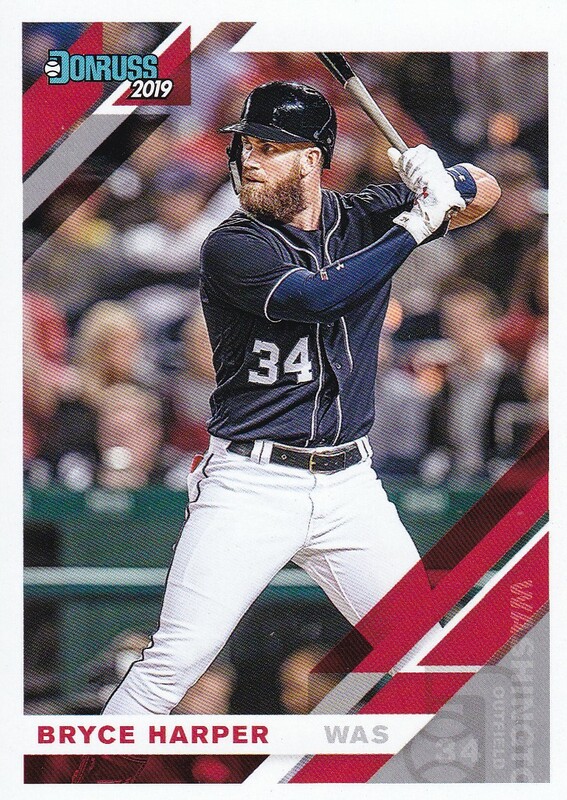 Not sure what the deadline for printing Panini had for these, probably way before the start of Spring Training and Harper didn't have a team until about a week before the regular season began. Also he is wearing the home blues uniform, which is usually on Holidays and I think Sundays, or is it Saturday day games? My first thought seeing that card was it was some Brewer, then recognized it as Harper due to number and looking at his face. MLB really needs to fix the licensing issue. Why have only one? Competition makes for better variety and ingenuity. Maybe some day. I do miss the team logos on the Donruss cards, but until that changes, I will just have to get used to not seeing them. Anyway, I do like he Diamond Kings from this years set. I am thinking about trying to put together a complete set of them. I just wish there was more on the back of each Diamond King. I'm slowly picking up all the classic Perez Diamond Kings sets. Those were great. I do like some of the newer DK offerings but for now I'll concentrate on the Perez offerings. If you get extra Diamond Kings from this year, think of me. I have been thinking of doing the same thing. Logos or not, I had a lot of fun with this set. Panini did good by including 3 hits in each hobby box. Three hits is a big plus. The lack of license can be overlooked no question. Doesn't mean these aren't good cards. It can just be a bit distracting.